I was in one of my favorite stores when I saw a line a of mason jars sitting on a shelf as decoration. It was a few weeks before our wedding (we planned it in only three months anyway), and I was still trying to think of what to use for the centerpieces in the big, rustic log cabin style lodge. When I walked over and took a closer look at what was inside, I saw each jar held a different antique print, the kind you'd see in a family heirloom album while rummaging through your grandparents dusty boxes. I knew I'd found exactly what I wanted to do, so I asked the girls to share the secret and they told me: vegetable oil. Here's the original post I created to share how I created these for our day. Two years later these same jars are sitting in my office, and while I'm now editing other people's wedding photographs I can look over and be reminded of how incredible our day was too. The images have held up better than I had hoped, bleeding a little at the edges and becoming a little more translucent, but in my opinion it's only getting better with age. I thought I'd pass along this simple but amazing DIY project that I put together for our centerpieces. It's a super easy 3-step project that adds a vintage touch while allowing family, baby, or engagement pictures to be incorporated into your reception decor. 1.) 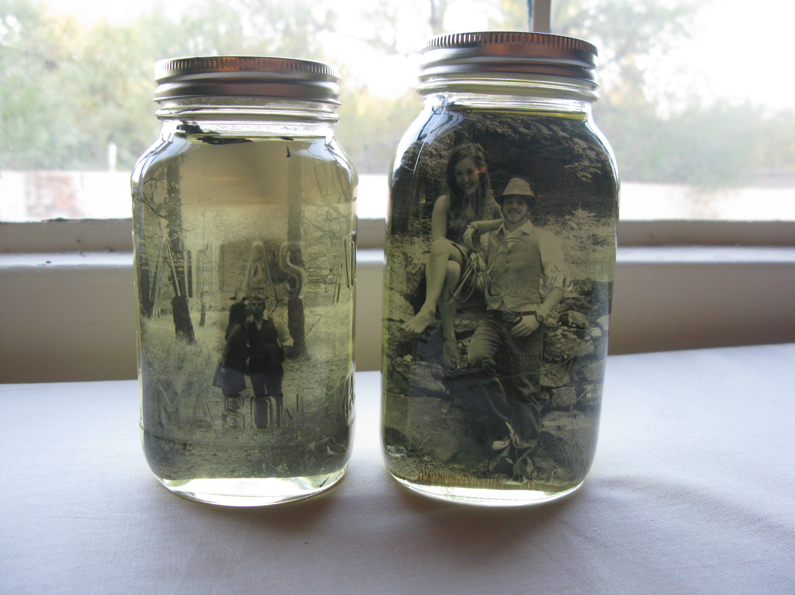 Insert your picture into the mason jar and pour enough vegetable oil to cover completely. 2.) Put some dried flowers on the opposite side of the picture. I chose lavender, essential oil anyone? Yum, it smelled good! 3.) Tighten the lid up and it's done! 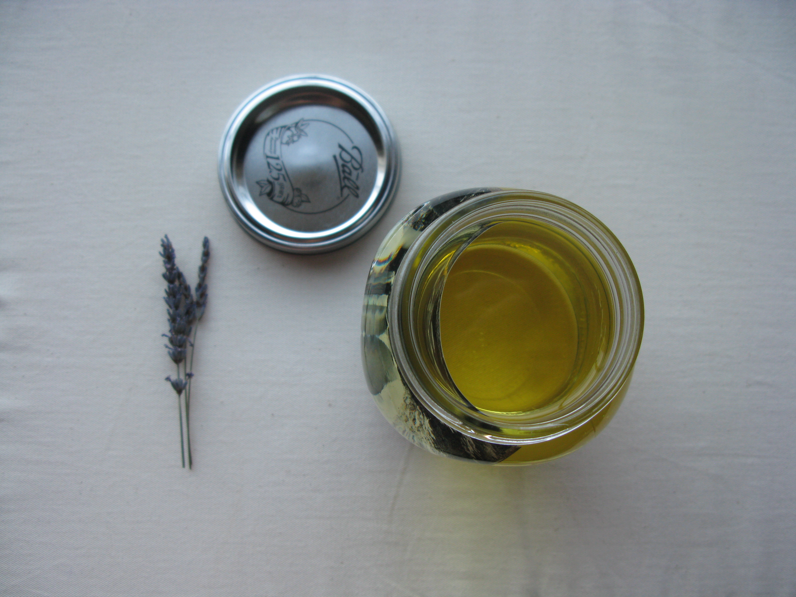 The vegetable oil will suspend the picture inside the jar without penetrating it, causing it to look aged and slightly transparent. A total vintage look of old yellowed pictures from the past. Remember, you can take any spin on this you want, but there's a beauty in the natural look of a black and white image in sepia toned oil. Good luck creating yours! Wow, Sis!!! That's fantastic! Can't wait to help you make them tomorrow! That's a ridiculously cool idea. amazing!! your entire wedding is inspiring, absolutely gorgeous. congrats to you both!! Of course I don't mind Kiley, I'd be happy for you to steal it for your blog :) I'm happy if it inspires just one bride to create her wedding for a more sane budget! LOVE IT. So beautiful. Do you know how long photographs will last in the oil? The photographs are actually on top of our organ still in the jars and oil. The pictures have definitely started to wear, with separation in short little vertical lines all over the picture with the white background showing through. It still looks antique and neat in a way, so it all depends on the look you're going for. As for how long they will ultimately last.... we'll just have to see! Are the photographs used analogue? or are they digital prints? This is amazing. I have a couple of technical questions, if you don't mind. 1. Can any oil work, or does it need to be vegetable oil? 2. Can one dye the oil without ruining everything? 3. How long did the pictures "last" before they started to show the effects? That is, can this be done more than a day or two before the wedding? 4. Where on earth did you learn to do this? 1) I don't know if any oils works... you could experiment! I know for a fact vegetable oil works, so I stick with that. 2) I don't know about dye either... that's not really the vibe I was going for. Again, best thing is just to experiment! 3) These jars were created a few days before my wedding, but almost 2 years later they're still intact! I have the one I created above sitting on my desk right now. Still looks stellar! Just a little more aged. 4) I saw it at Anthropologie. I asked and received. Oops! And Karen: I went cheap and printed the pictures at Walgreens. I think pretty much any image will work. Just made my own spin on these tonight for my wedding!!!!! THEY TURNED OUT WONDERFULLY!!! THANKS FOR SHARING YOUR IDEA! I have been trying to make something like this for weeks but I've been using water and the pictures keep deteriorating! I'm so happy to have found a way for the pictures to survive longer than the honeymoon! PS getting so much inspiration from your blog. Love it! so cute! saw this on pinterest and i HAVE to do it for my friend for christmas :) so excited! I wonder if you laminated the picture first if it would last longer??!! I'll bet you could keep it forever if you did that!! do you think the picture would last longer if it was laminated? I really love this idea, so super awesome! @Josalyn - Laminating would definitely preserve the picture longer because it would be fully sealed in plastic. You just have to decide how you want it to look though! My style is more natural and I like the images looking aged as time goes on. Two years and it's still looking awesome! These are so beautiful and unique! I'd love to try some. Lovely blog and I love what you've named it! Could you put pictures back to back so that you could see the image from both sides? @Anon - What I've discovered is that whatever you add affects the image erosion speed. In my jars where it's just lavender, the images have lasted over 2 years. The images in my parents jars that have dried perfumed flowers haven't lasted as long. I'm assuming if you use something to attach the pictures back to back it would eventually have a negative effect, but you can always try! Anything will work temporarily, but if you want it to last as long as possible the best would be pure oil and a high quality print. I love this idea, but I want the oil to be clear, like in the last pictures... how did you get the color out of the oil? Just time? Thank you for sharing this neat idea. I am having a wedding this September and was planning on using mason jars but NO CLUE what to put in them and this made up my mind. love this so much & cant wait to make for my center peices. @Anon - All the pictures are using the same oil. The color hasn't changed, I think what you're mainly seeing it the lighting in the rooms effecting it. It's basically what you see is what you get, but I guess you could always try other oils...? @Stacey Kay- Awesome! Have fun with it! I am going to scan some of old pictures of my Grandparents and send them to Walgreens to print and then do this. I sure hope it works this way because this is just way cool. 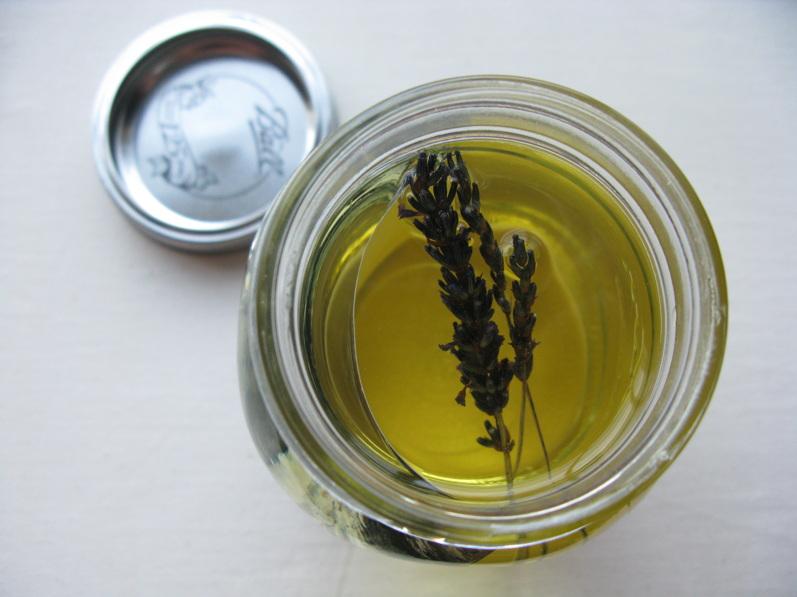 Where do you purchase the sprig of dried lavender? I made these last weekend for my sister's wedding shower and they came out really well. I used a variety of other flowers from the yard in place of lavender, including cherry blossom sprigs, hyacinth, and rosemary. I don't know if they will last as long in the oil since they weren't dried, but they looked great. I also cut some swaths of off-white linen and tied them in bows around the tops of the jars to make them a little more "wedding-y". 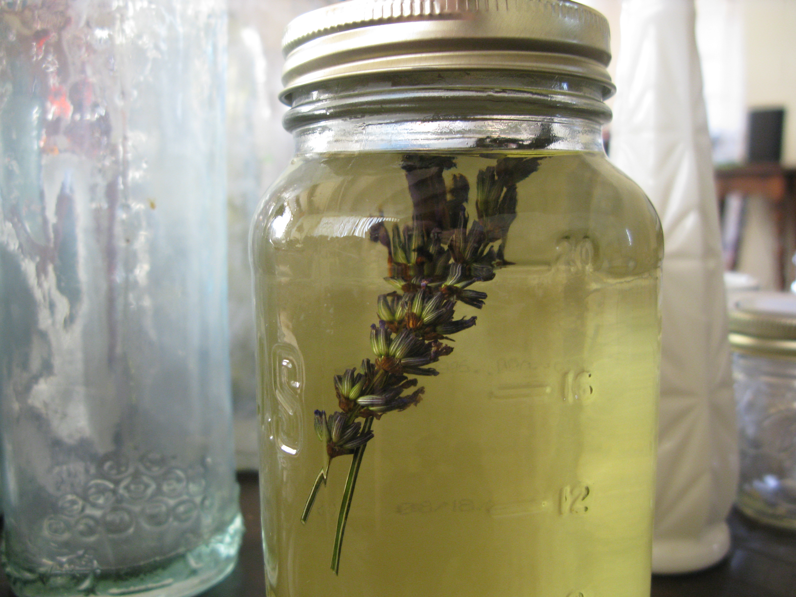 Why the lavender if the jar is sealed? I'll share on my blog, ok? i'm guessing this will work best with vertical pictures? all of my good pictures from my camping trip are horizontal! hi! i love this project :) you're a genius!!!!!!!! i just have a question, do you think if i put more than one photo around the sides of the jars (without using glue or anything) would the effect last as long and would the pictures stay in position or would they move around the oil? Did you seal the jars...thought they might leak? Fabulous! I was looking for a project for my husband for Father's day, and this is it! I always try to keep his office desk up to date with pictures of our boys and this will be an interesting way to display them. Thank you. This is absolutely gorge!!! My sis & I are going to experiment with these--we'll keep you posted. A belle is mighty crafty, but this is too fab!!! @ Anon -- If you wanted to "clear" effect, I would think using old-fashioned mineral oil would work. I love this idea , Our Daughter is getting married and she would like decorations on the tables , I was thinking this may be the ticket to our Idea for this , You do knot have to put anything in the jar as flowers do you ? Other then the oil ? This is so pretty! Quick question, in some of the pictures the oil looks much more clear and others much more yellow, was this just lighting or did you do something different to them? Katherine- It's really just the lighting. They all looked the same! Wow very nice idea !!!! wonder if you could laminate the photos and then you could suspend them in anything?? I used your idea and placed pic's of daughter and fiance in the jar of oil and then used a fabric with her wedding colors to line the mason jar lid. I added some cotton under the fabric to give it a quilted 3 dimensional look. Everyone absoloutely loved it!!! I've seen photos out there of mason jars filled with oil and wicks inserted to burn as candles. Do the jars have to be sealed for the picture to be preserved? Does the Picture have to be black and white?! I absolutely love this idea and it's perfect for our "film" theme wedding (he's in the film industry & I'm a photographer). I was wondering though, could you put 2 pictures in? Also, is there a way I could make the oil purple, like food colouring, without damaging the images. How much oil do you put in the jar?Great idea! I want to do this on the back of a mirror that has been partially rubbed off w/acetone to create an antique look on the mirror and the image. Any ideas? Beautiful! I've made four jars already! They are gorgeous. I tracked your mason jar pictures article down via a pin on Pinterest that did not have a link to you. So glad I found your detailed instructions. 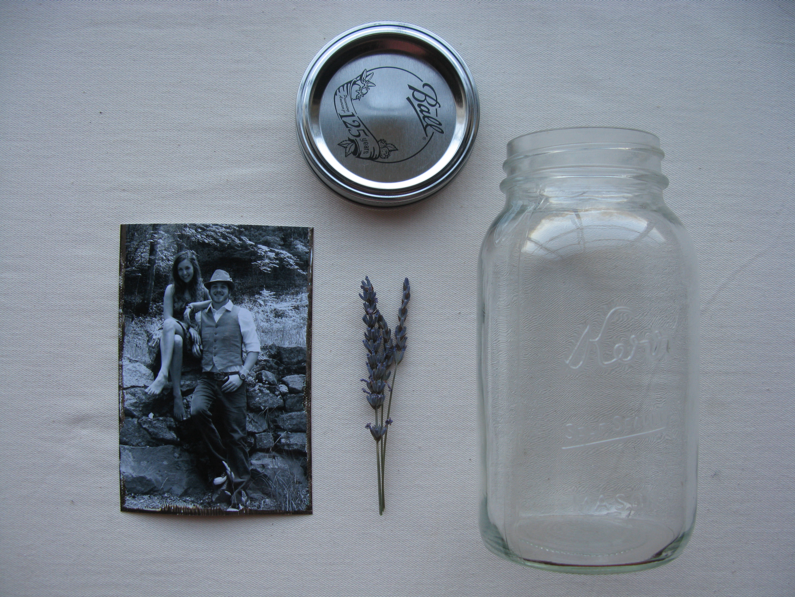 I will be creating mason jar photo keepsakes in the near future. Thank you for a great idea! Do you ever remove the oil? Does anyone know what kind of finish the pic has to be... glossy or matte? I want to make these but want to make sure I print off the right kind of picture. 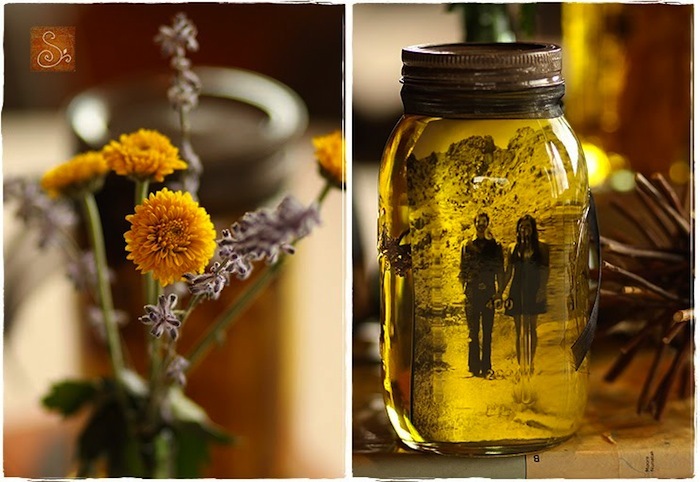 Do you have to put dried flowers in the jar? Or will it work without it? 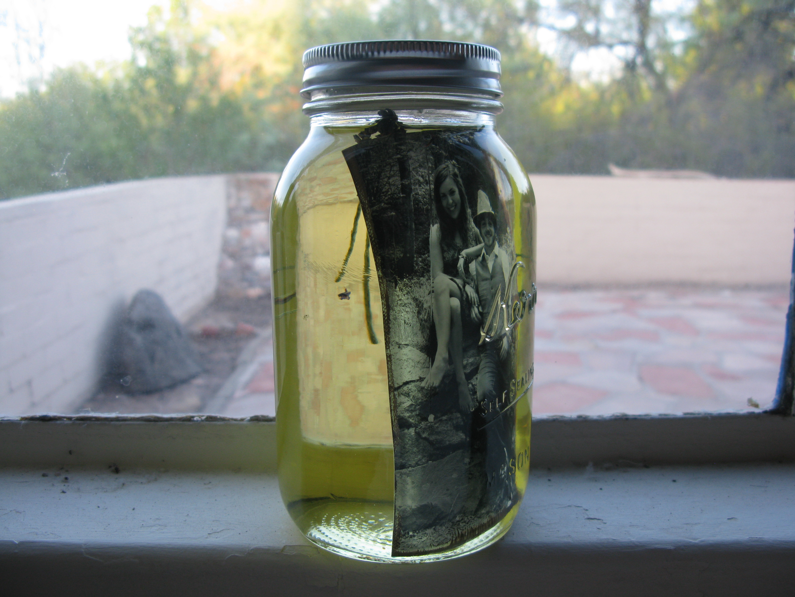 I just received a photo of my daughter in a jar with oil. Does anyone know the science behind this?? Yes, it is awesome but I always need to know why it's awesome. Because that's how i roll. This is a very interesting idea. I plan on making one for my sisters B-Day in August; and perhaps one for mom with my sis and brothers pics (who passed away a couple of years ago). This would make a wonderful rememberance for her. Keep up the good ideas!!! Thanks. We are having our 1st family reunion this year and I was looking for the perfect center piece. I am so glad I found your blog. I can't wait to make these! I'm going to make copies of old family photos and laminate them in hopes that they last longer. I know my family is going to want to keep these as a keep sake. This is great... Does this work with pictures in color? How about one photo on each side? How do u keep the photo to stay in place? Is it safe to use an old black and white photo? If laminated, maybe use a sienna (brown) colored photo for the vintage look and crop the laminate close to the picture. Fabulous idea! Got me thinking of a few picture projects of my own....thanks! The original post says olive oil, and this says vegetable oil. I am a bit confused, which is it or either? A different variation... I used the HUGE mason jars and filled them with water. I put 2 laminated, 5x7 pics in the jar. I left the tops off the jars and used them as a vase with flowers. The stems of the flowers kept the pics from moving. At my wedding, people LOVED them as centerpieces. The big mason jars are better if you're using them as centerpieces. Water is obviously a cheaper variation, too. wonderful idea! I love pictures and mason jars. thank you for posting! I would definitely laminate my pic before putting it in the oil. In store photo printers are usually LASER photo printers. The oil will likely lift Inkjet ink, the type of ink used by most inexpensive home printers, off the paper. Unless you first laminate the photo with a heat laminator. 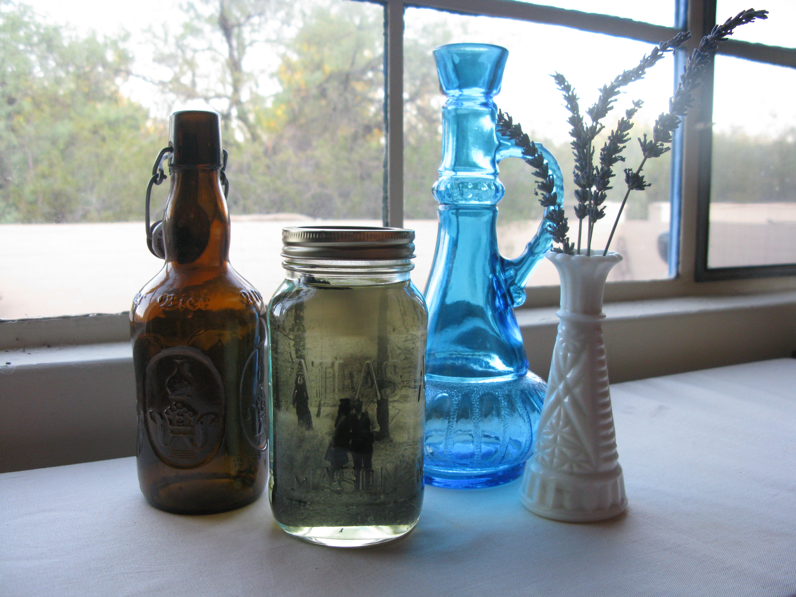 Most oils should work with this project, including clear mineral oil. If you want a more "modern" look, try a more up to date container, like a peanut butter or jelly jar, a color print and mineral oil. Tq for your idea. Can I use any kind of paper to print? If you want it to be clear try oil, lamp oil. I have put artificial veg. and fruit in a jar with this oil and it is beautiful. Try the color see if it works. I would just try food coloring. I'm going to go try it now. I love this idea for displaying photography. I was looking for the answer on using matt or glossy prints. Does anyone know the answer? I like the idea of using laminated or acrylic protected prints. Does anyone else have a story of how their jar has lasted after a year? How long will the flowers stay?shud i use baby oil instead of vegetable oil to retain the color of the flowers? These are all such amazing ideas! There's so many different variations you could do to this too, hours of fun! Questions? Can you use as a flower vase after picture has cured? I would really like to make as centerpieces and put fresh flowers in them? How long does it take to cure? would a colored picture work? or does it have to be black and white? I want to do this but add pictures all around. I am very interested to learn more and more about Candles for Wedding. Your site is very much helpful to give us latest information on Mason Jar Candles Wedding. 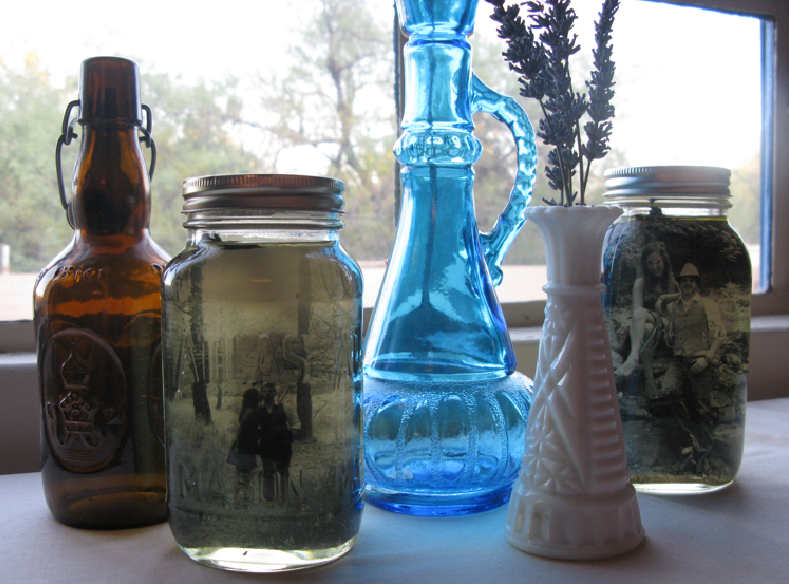 These DIY vintage pictures and mason jars are superbly created. I am so pleased to have these wonderful ideas for my sister’s wedding party. Her wedding is in next month at one of famous domestic wedding venues Chicago. Please share some more vintage decor ideas! Im going to use MOTOR OIL instead of vegetable oil for a deeper yellow tint! Thank you!! For anyone that has done this with vegetable oil...does it look like a jar of urine sitting on the wedding reception table? I want to avoid that look! Hi friends thank you so much for posting such wonderful information via blog, I really like the concept of your Flowers For Sale in India Flowers For Sale in India ,. There is another classified website to post ads free or paid. you can visit https://www.helpadya.com or call at +91-8527198118. Solar jar - Get the best deal on solar jar, solar lanterns, solar jar lights, hanging solar lights, solar glass jar, solar hanging lights, hanging solar lights, hanging solar lantern, mason jar solar lights & outdoor decor on amazon.com from great selection at Sogrand Industry Inc Store.